What a price and what a quality sharp looking jacket! Beautiful leather, so comfortable, and many compliments on my Christmas gift for myself! Seen the same jacket elsewhere for almost triple the price. Lucked out with this purchase! Powinda Sports is a Baltimore MD based company specializing in manufacture and sales of leather apparel and sporting equipment and accessories. We specialize in manufacture of all types of motorcycle riding gear and accessories. 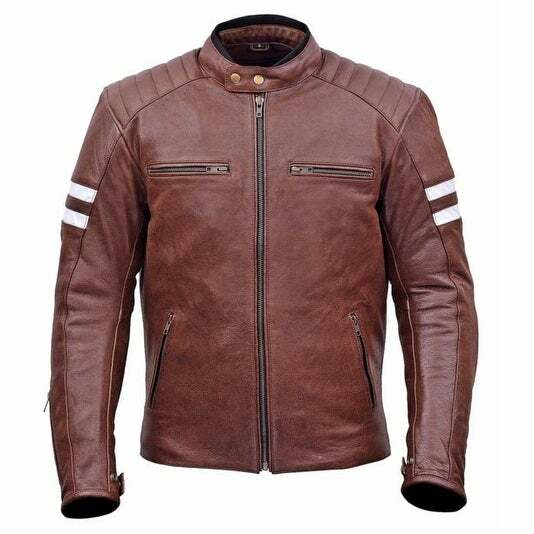 Our goal is to bring the best possible shopping experience to any enthusiast who visits our online store looking for motorcycle jackets, apparel, motorcycle gear, accessories & almost everything else that goes on your person or your motorcycle. For customer service inquiries or to initiate a return, please contact Powinda Sports at overstock@wickedstock.com or (410) 585-5467. You can initiate a return for new and unopened items within 15 days of delivery for a refund. To qualify for a refund, items must be in new and unused condition with all original materials and/or accessories. If a return is not received at our processing facility within 30 days, it may be subject to a partial refund. You will be responsible for return shipping costs. However, if the return is a result of a fulfillment error, product defect, or damage incurred during shipping, we will refund the full cost of the merchandise. We will provide a pre-paid return shipping label for Non-Buyer's Remorse returns. All returns are subject to inspection, and if found not to be an error on our part, the return shipping costs will be withheld from your refund. SPECIAL RETURNS INSTRUCTIONS: The Seller cannot accept returns for used items. The Seller charges a restocking fee of 10% that will be withheld from the refund. Once the seller approves the returns request, they will provide a Returns Merchandise Authorization. Top Grain 1.1 to 1.2mm drum dyed cowhide for maximum abrasion resistance.Fully removable 5-piece CE certified armor for elbows, shoulders and back. Full sleeve quilted zip out thermal liner for warmth and comfort. 2 inside utility pockets: one zippered and one snap pocket. Liner has third pocket for media and cell phone etc. 4 outside pockets: Two chest level pockets and two waist level zippered pockets. Additional right forearm pocket is zippered. Neoprene padded mandarin collar is adjustable via two front snaps. Zippered cuffs are adjustable. Adjustable waist straps for custom fit. 1.5" storm flap at main front zipper. Padded shoulders. 8" pant integration zipper. We provide Limited Lifetime Leather warranty. Our Lifetime Guarantee is a warranty against defects in Leather and workmanship. Our leather, as with all natural materials, will occasionally have unique characteristics such as: small scars, creases and variations in the color and are not considered defects. This jacket is the perfect leather jacket for me. I don’t ride motorcycles often yet it is a great leather jacket riding or not. It is high-quality in leather, soft but very durable. Looking forward to getting lots of wear out of this. I’m loving it. I must say, that for the $$ what a great deal! The quality is spot on. I think it would stand up to the $400 dollar jackets by big motorcycle brands. The size was great I’ll 6-1”, and not in the best of shape lol. I got the jacket in a 2x fit great with a little extra room if needed. I highly recommend this product! After my coupon I got it for $116 can’t be beat! This jacket is everything I expected. Fits perfectly. I would definitely recommend it. The jacket is nice However the size isn't a great fit. If I was to go bigger the sleeves would be too long. For my son as a Christmas present. I think it would look great on him and is a great style. "does this jacket have pockets for optional armor in elbows, shoulders and back?"